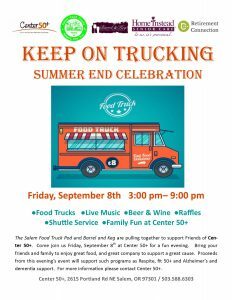 The Salem Food Truck Pod and Barrel and Keg are pulling together to support Friends of Center 50+. Come join us Friday, September 8th at Center 50+ for a fun evening. Bring your friends and family to enjoy great food, and great company to support a great cause. Proceeds from this evenings event will support such programs as Respite, fit50+, and Alzheimer’s and dementia support. This event includes Food Trucks, Live Music, Beer & Wine, Raffles, Shuttle Service and Family Fun. For more information, call Center 50+ at 503-588-6303. Be sure to Register Here for a table and to check out all networking opportunities. Fore more information, please contact Mariyln Daily: MDaily@cityofsalem.net / 503-588-6303.